One branch on the tree of life is a bit more crowded today. A team of scientists led by 20-year-old University of Toronto undergraduate student Joseph Moysiuk has finally determined what a bizarre group of extinct cone-shaped animals actually are. Long believed to belong to the same family as snails, squid and other molluscs, a study published today in the prestigious scientific journal Nature shows that hyoliths are instead more closely related to brachiopods – a group of animals which has a rich fossil record, although few living species remain today. Brachiopods have a soft body enclosed between upper and lower shells (valves), unlike the left and right arrangement of valves in bivalve molluscs. Brachiopods open their valves at the front when feeding but otherwise keep them closed to protect their feeding apparatus and other body parts. 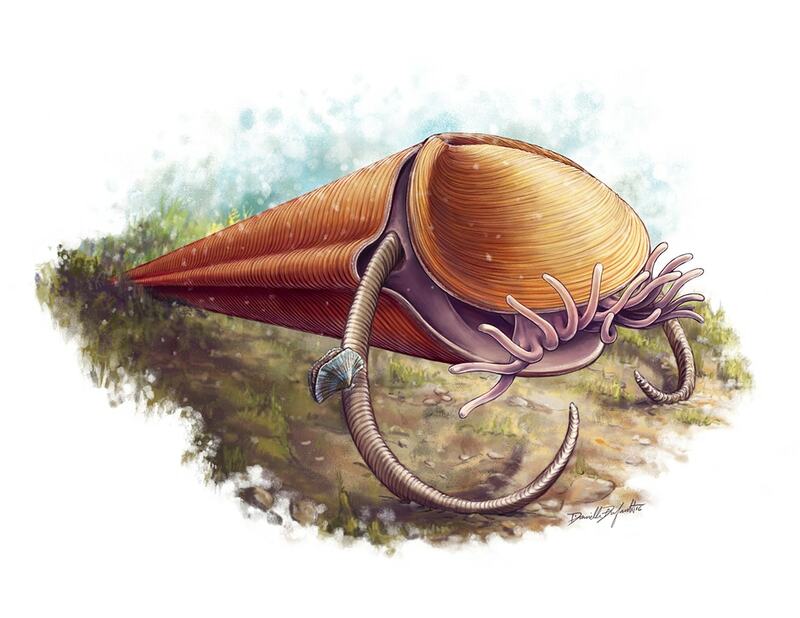 “Our most important and surprising discovery is the hyolith feeding structure, which is a row of flexible tentacles extending away from the mouth, contained within the cavity between the lower conical shell and upper cap-like shell,” said Moysiuk. “Only one group of living animals – the brachiopods – has a comparable feeding structure enclosed by a pair of valves. This finding demonstrates that brachiopods, and not molluscs, are the closest surviving relatives of hyoliths. “It suggests that these hyoliths fed on organic material suspended in water as living brachiopods do today, sweeping food into their mouths with their tentacles,” Moysiuk said. Moysiuk, who studies Earth sciences and ecology & evolutionary biology, completed this project as part of the Research Opportunity Program at U of T, a special undergraduate research program in the Faculty of Arts & Science. He received the Best Poster Award for his research from the Paleontological Association meeting that was held in France last month – a very high achievement considering the competition included master's and PhD students. The distinctive appearance and structure of the hyolith skeleton has obstructed previous attempts to classify these animals. All hyoliths had an elongated, bilaterally symmetrical cone-shaped shell and a smaller cap-like shell that covered the opening of the conical shell (known as an operculum). Some species also bore a pair of rigid, curved spines (known as helens) that protruded from between the conical shell and operculum – structures with no equivalents in any other group of animals. Moysiuk and his coauthors, Martin Smith at Durham University in the United Kingdom and Jean-Bernard Caron at the Royal Ontario Museum (ROM) and U of T, were able to complete the descriptions based mainly on newly discovered fossils from the renowned Cambrian Burgess Shale in British Columbia. “Burgess Shale fossils are exceptional because they show preservation of soft tissues which are not usually preserved in normal conditions,” said Caron, Moysiuk’s research supervisor, who is the senior curator of invertebrate palaeontology at the ROM and an associate professor in U of T’s departments of Earth sciences and ecology & evolutionary biology. Caron led recent fieldwork activities to the Burgess Shale, which resulted in the discovery of many specimens that form the basis of this study. The key specimens came from recently discovered deposits near Stanley Glacier and Marble Canyon in Kootenay National Park, about 40 kilometres southeast of the original Burgess Shale site in Yoho National Park. The Burgess Shale is one of the most important fossil deposits for studying the origin and early evolution of animals that took place during the Cambrian period, starting about 542 million years ago. Hyoliths are just one of the profusion of animal groups that characterize the fauna of the “Cambrian Explosion.” They became a diverse component of marine ecosystems around the globe for more than 280 million years, only to go extinct 252 million years ago, prior to the evolution of the first dinosaurs. The Burgess Shale, located in Yoho and Kootenay national parks, from which the specimens were recovered, is part of the Canadian Rocky Mountain Parks World Heritage Site. Parks Canada protects this globally significant site and supports peer-reviewed scientific research that continues to enhance our understanding of these rich palaeontological deposits. This new discovery adds another element to the dramatic story of early animal evolution that Parks Canada guides share enthusiastically with hundreds of park visitors every year. Funding for the research was provided primarily by the Royal Ontario Museum and a Natural Sciences and Engineering Research Council of Canada Discovery Grant to Caron.